Who wouldn’t want a fall garden abundantly producing cabbages, broccoli, carrots, turnips, parsnips, radishes, bok choi, Brussels sprouts, a wide variety of greens, and even peas? The trick to growing a cool season garden, and setting up the fall garden to continue through winter, is planning and preparation. Check your understanding of cool-season. When grown for fall, many “cool-season” plants actually need to be sown and transplanted in high summer heat, and some as early as June. Make room! We start our winter crops in August and September, and those plantings will need to supply us through February! We need lots of space for these plantings, so planning ahead is critical. Below are our tips for getting the most out of your fall garden. Look for storage varieties: these varieties have been bred to be grown in the fall and harvested for winter storage, or left in the ground to be harvested during thaws. Storage tomatoes can be harvested green to ripen slowly wrapped in newspaper in cardboard boxes; storage beets and radishes grow very large and keep well in the ground or root cellar. Of course, be sure to choose the crops that you and your family enjoy and that are well-suited to your climate! Calculate back from your average first fall frost date to determine when to plant fall crops. Add 14 days to the listed days to maturity for your variety to account for the “fall effect” of shortening days and cooler temperatures. For plants with a long harvest period, like a broccoli that will make side shoots for 3 weeks after the central crown is gone, add that time in as well. (This may be as long as a month or more.) Add an additional 14 to 28 days if you will be starting transplants from seed, to account for transplant shock and setback. For us, this means sowing most broccoli and cabbage in late June, with a second sowing 2 weeks later and often a third that we plan to keep growing under row cover until Thanksgiving or later if the weather is with us. Sowing seedlings in pots or flats for transplanting out later lets you start your fall garden before space is available in your outdoor garden. Use benches or tables high enough off the ground (at least 3 feet) to deter flea beetles or use an enclosed shade structure. We sow our fall crops in outdoor seedling beds well-supplied with compost in a location shaded from the harsh afternoon sun. The north side of a stand of corn, caged tomatoes or pole bean trellis makes an excellent choice. Outdoor seedling beds should be covered with thin spun polyester row cover or the newer Protek net row cover to guard against flea beetles and other insects. Summer broccoli and cabbage seedlings are ready to transplant in 4 weeks during the summer. Lettuce and Oriental greens in 2-3 weeks. Come summer, it can be tempting to fill every inch of the garden with summer tomatoes, peppers, squash, melons, and more. 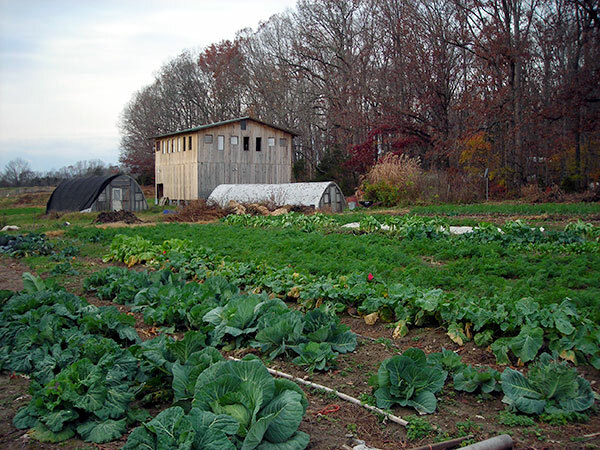 But even the most densely planted garden will still afford room to plant fall crops. Summer lettuce, green beans, radishes, greens, and root vegetables all yield space by late summer for the fall garden. Beds that were once filled with spring cool-season crops, like peas and fava beans, often rotate best into fall cool-season crops (if they’re not used for late summer successions). Plan for summer cover crops to be ready to turn under in time for fall crops. When will each spring and early summer crop be finished harvest? You can calculate using the listed days to maturity, but we find that a mid-point check allows us to adjust for weather, later-than-planned planting, early bolting, or unexpectedly extended harvests. Caring for the soil is even more important when growing 2 or 3 crops a year in the same area. Generously add compost and any other needed amendments before planting your fall crops. Keep plants growing fast and reduce risk of disease by providing regular and adequate moisture (at least 1 inch each week). If you’ll be planting in cold frames, under row cover, or in a greenhouse, you can adjust your average last frost date backwards by two weeks or longer when calculating when to plant fall crops.